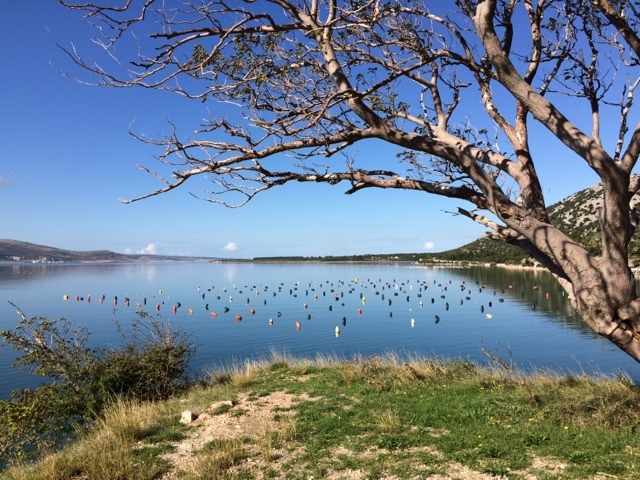 Croatia has one of the most stunning coastlines I've ever seen, and the road that follows it is easy travelling. We've been taking our time, mostly because the weather has been bad and so we've spent time 'waiting it out'. Obviously, the spectacular Croatian coastline can be better appreciated when the sea sparkles and a blue sky is above. And we've got time. I have already written about some gale forced blustery winds that we experienced south of Rijeka. This area regularly has bad winds, called Bora (bura in Croatian), as evidenced by many road signs that warned caution, but we seemed to have a extra treat. This was evidenced by a BBC weather report showing a storm right where we were, the number of times the locals came to check (and bale out, during lulls) their small boats over that night (we street camped in view of a small boat harbour), and that, when we took refuge in a campsite the next day (it was still blowing) the owner later came to tell us it would be over by noon the next day. Aside from that storm, the Croatian weather has been pretty much the regular gusty bora plus 2 days of rain followed by a day of fine weather, again and again. Even when I could check the weather and decided we'd go hiking in the stunning Paklenica National Park we spent time sheltered under a rock overhang to keep dry after about 4kms of hiking (we hiked from town into the park). Rain is normal for Autumn here. We had just hoped that it wouldn't rain this much. It's also meant that much of the hiking and the boat excursion of Krka National Park weren't available and instead of the pretty cascades we'd seen photos of we witnessed thrilling flooding and thunderous movement of water. 'autocamps' for electricity and wifi access. Also, worth mentioning for other 'motorhome travellers', parking for Motorhomes in Croatian cities is often 5 times the price of regular cars yet we only take a regular car space!). It takes away from our experience and makes us rush instead of visiting extra things/stopping for coffee/ shopping. So, next to the city of Split we visited the impressive 'Solin' archeological site. And then we left Blac there (free parking), and took the bus into the Split centre and back. Bus number 1 (there and back) cost about as much as 2 hours parking and we didn't need to watch the clock. We think these are mussel farms. But we haven't been able to ask anyone. There's lots of them. 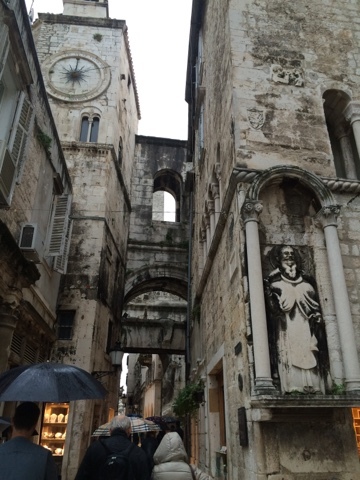 We visited the city of Split in the rain, it's a stunning city, although wandering round with an umbrella does detract from the experience. 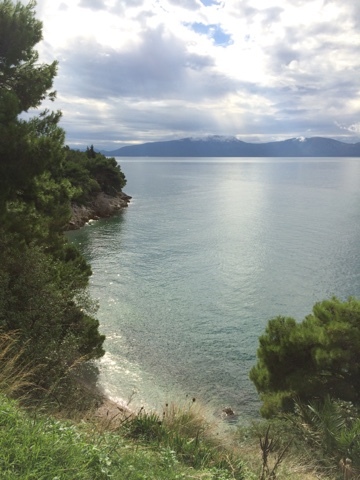 The Croatian coast, south of Split.